No more carrying your luggage between your stays. Relax in Japanese modern atmosphere, we will treat you with real Japanese Green Tea (matcha) ceremony! 1. Check-in time: 3pm - 10pm. Please contact us in advance in case you wish early or late check in. (1) The Japanese Ministry of Health, Labour, and Welfare requires all international visitors to submit their passport number and nationality when registering at any lodging facility (inns, hotels, motels, etc. ). (2) Lodging proprietors are required to photocopy passports for all registering guests and keep the photocopy on file. 3. Payment: Cash (JPY) or credit card (Visa, Mastercard, Amex, JCB) is welcomed when check-in. 6. Reception Hours: The front desk is open daily from 9am to 10pm. 8. 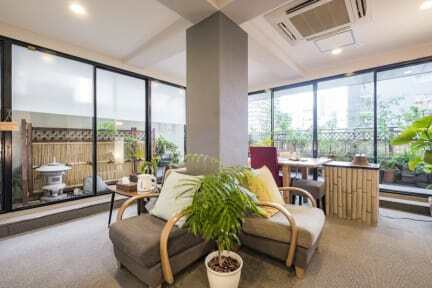 Pets are not allowed.Conveniently located in the middle of Tenjinbashi-suji Shopping Street, the longest shopping street in Japan, and in the vicinity of old temples, historic heritage sites, and commercial facilities, Sakura La An offers easy access to various areas. Sakura La An occupies the renovated top floor of a 50-year-old retro building dating back to 1964, the year of the Tokyo Olympics. Our common area has a sunny terrace and garden, where guests can help themselves to coffee or green tea and enjoy our small library of books on Japanese art, architecture, pottery, tea ceremony (chanoyu), traditional kaiseki meals, and other traditional arts and crafts. Cultural experience programs for tea ceremony, kimono-dressing, and calligraphy are available (additional fees apply). A combined kimono-dressing and tea ceremony program is offered in our tranquil tatami-floored tearoom. A small hostel but really nice. The staff is really kinde and helpful. In this hostel the facilities are clean and well equipped. Super comfortable bed, nice guest room. 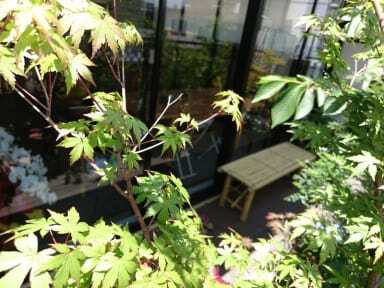 The staff is very kind and you'll get the chance to try a chanoyu (tea ceremony) in a relaxed and cozy atmosphere. Totally recommended, I hope to come back some day!